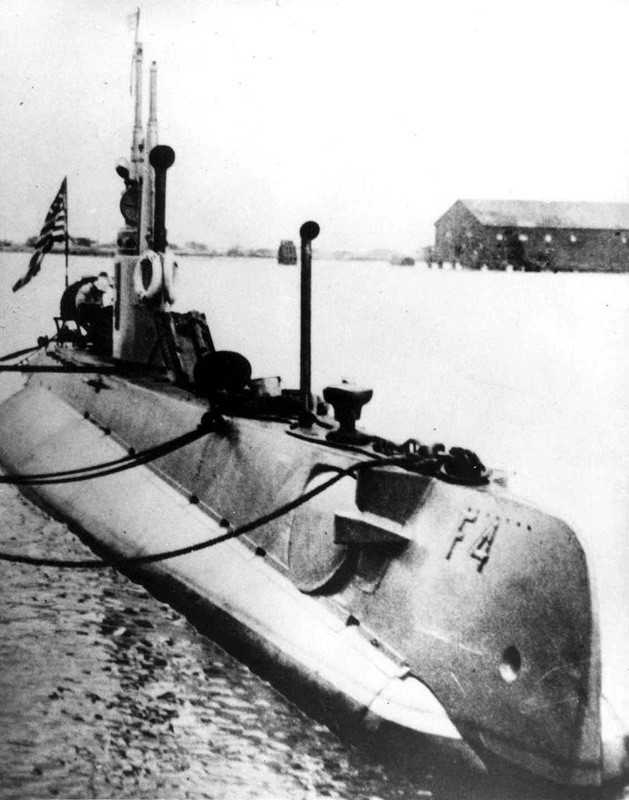 On April 11, 1900, the Navy purchased the Holland VI, an internal combustion, gasoline-powered submarine from John P Holland for $160,000, after demonstration trials off Mount Vernon, Virginia. This marks the official birth date of the US Navy’s Submarine Force. Even before the United States entered World War I, the submarine was recognized for its deadly role in warfare as German U-boats torpedoed and sank British shipping in the Atlantic. Military submarines made their first significant impact in World War I; U-boats saw action in the First Battle of the Atlantic, and were responsible for the sinking of Lusitania, and this is often cited among the reasons for the entry of the United States into the war. USS F-4, an F-class US submarine, was originally named Skate, making her the first ship of the United States Navy named for the skate (a type of ray.) She was renamed F-4 on November 17, 1911. The F-4 and three other F-class submarines, the F-1, F-2 and F-3, along with their support vessel, the tender USS Alert, made up the First Submarine Group, Pacific Torpedo Flotilla, participating in the development operations of that group along the west coast, and from August 1914, in Hawaiian waters. They were the first US submarines to be stationed to the new naval facility at Pearl Harbor. While on a training mission, on Thursday, March 25, 1915, the US submarine Skate (F-4,) with a crew of twenty-one men, exploded and sank in fifty fathoms of water three-quarters of a mile off of Honolulu harbor. There had been other submarine fatalities and accidents in world history, but this was the first submarine disaster in US naval history. There were round-the-clock attempts to make contact with the submerged vessel. It was lodged three hundred feet below the surface, and divers could not reach it. After dragging cables across the ocean floor in the area in attempts to snag and locate the submarine, it was caught late in the morning of the 26th. The 142′ long submarine, with a diameter of about 15′, displaced 330 tons and could not be moved. Using a combination of hard hat divers, cables, chains and heavy scows with winches, the F-4 was incrementally raised and moved closer to shore over the next two months. Frank William Crilley, a Chief Gunner’s Mate, made dives to over 300 feet during salvage operations on the sunken Submarine. On April 17, 1915, he rescued a fellow diver who had become entangled at a depth of 250 feet. For his heroism on this occasion, Frank William Crilley was awarded the Medal of Honor in 1929. Five months passed before the submarine could be hauled to the surface. After so many months underwater, only four of the 21 dead aboard the submarine could be identified. The 17 remaining bodies were sealed in four caskets and shipped to Arlington National Cemetery, where they were buried in a common grave. The headstone was going to be replaced and destroyed, but it was retrieved and is now part of the Bowfin Museum in Pearl Harbor. After the drydock examinations of F-4, the vessel was towed by the tugboat Navajo, using the six pontoons, to “an out of the way spot at Pearl Harbor” with a depth of fifteen to twenty feet that was “as nearly beached as possible” with “the pontoons keeping her clear of the harbor floor”. Apparently the F-4 was left in this spot, to “rot in the mud bank” presumably near the head of Magazine Loch. Periodically since, the Navy has announced plans to either destroy or examine the F-4 – the oldest surviving U.S. Navy submarine — but because of the deep silt in Pearl Harbor, the exact location is unknown. In 1957, a more successful Skate was commissioned (the third US submarine named Skate.) It was the first production model of a nuclear-powered submarine to make a completely submerged trans-Atlantic crossing (1958) and the first to surface at the North Pole (1959). The image shows F-4, the Skate. In addition, I have added other images in a folder of like name in the Photos section on my Facebook and Google+ pages. 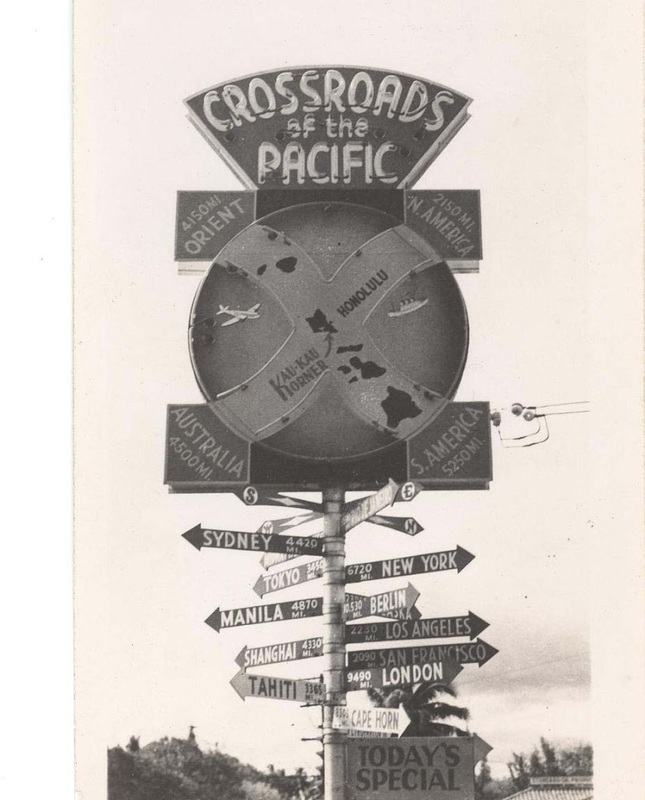 Kaʻākaukukui (the right (or north) light – and also called ‘Ākaukukui) was an original name for Kakaʻako. Marshland, reef, salt pans and traditional fish ponds existed in this area. The entire shoreline was a coral wasteland bordered by mudflats. According to an 1885 survey map, the ‘ili of Kaʻākaukukui was awarded by land court to Victoria Kamāmalu; Princess Bernice Pauahi Bishop inherited the land and it later became part of the Kamehameha Schools. 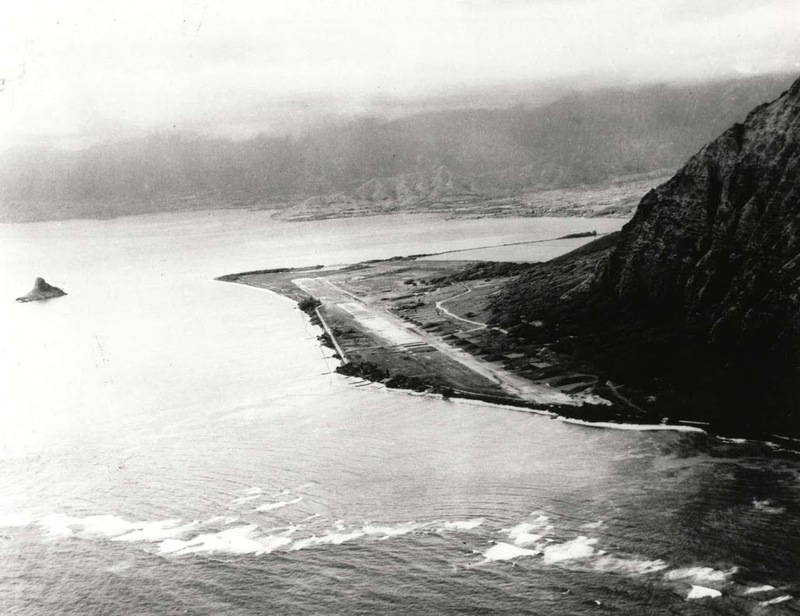 In 1898, the property was transferred to the United States by the Republic of Hawaiʻi under the joint resolution of annexation and, to protect the mouth of Honolulu Harbor, the US Army filled a submerged coral reef on the ‘Ewa side of Ka’ākaukukui for a gun emplacement. Armstrong (the son – namesake of the Fort) was born January 30, 1839 in Maui, Hawaii, the sixth of ten children. He attended Punahou School and later volunteered to serve in the Union Army during the American Civil War. At the end of the war, Armstrong established the Hampton Normal and Agricultural Institute – now known as Hampton University – in Hampton, Virginia in 1868. Perhaps the best student of Armstrong’s Hampton-style education was Booker T Washington. Samuel Chapman Armstrong died at the Hampton Institute on May 11, 1893, and is buried in the Hampton University Cemetery. They lived in tents for quite a long time; then temporary barracks were built – wooden structures that were continually occupied since January, 1914. Buildings are constructed of 1 x 12 rough boards, with tar-paper roofs. Fort Armstrong continued under the Coast Artillery program until September 15, 1922. It was reserved for military purposes by a series of Executive Orders in 1930 and was described as the Fort Armstrong Military Reservation. The image shows tents and other facilities at Fort Armstrong (1911-1920) (Hammatt – HSA.) In addition, I have included other images/maps in a folder of like name in the Photos section on my Facebook and Google+ pages. This custom was eventually adopted by the British navy whose ships fired seven-gun salutes, choosing the number seven because it was thought to be the luckiest of the odd numbers. And, it was thought seven was also selected because of its astrological and Biblical significance. Seven planets had been identified and the phases of the moon changed every seven days. The US Navy regulations for 1818 were the first to prescribe a specific manner for rendering gun salutes (although gun salutes were in use before the regulations were written down). For a time thereafter, it became customary to offer a salute of one gun for each state in the Union, although in practice there was a great deal of variation in the number of guns actually used in a salute. After 1841, it was customary for a US president to receive a 21-gun salute, with the vice president receiving 17. Today, however, the vice president receives 19. On Aug. 18, 1875, Great Britain and the United States announced an agreement to return salutes, “gun for gun,” making the 21-gun salute the highest national honor. In 1890, regulations designated the “national salute” as 21 guns and redesignated the traditional Independence Day salute, the “Salute to the Union,” equal to the number of states. Fifty guns are also fired on all military installations equipped to do so at the close of the day of the funeral of a President, ex-President, or President-elect. The 21-gun salute became the highest honor a nation rendered. It is also fired at noon of the day of the funeral of a President, ex-President or President-elect, on Washington’s Birthday, Presidents Day and the Fourth of July. On Memorial Day, a salute of 21 minute guns is fired at noon while the flag is flown at half-mast. While King Lunalilo was on his deathbed, he requested a burial at Kawaiahaʻo Church, with his mother on the church’s ground. He wanted, he said, to be “entombed among (my) people, rather than the kings and chiefs” at Mauna ʻAla (Royal Mausoleum) in Nuʻuanu Valley. While the sum of the digits in 1776 adds up to 21, reportedly there is no historical link to the year of our nation’s signing of the Declaration of Independence and the 21-gun salute. 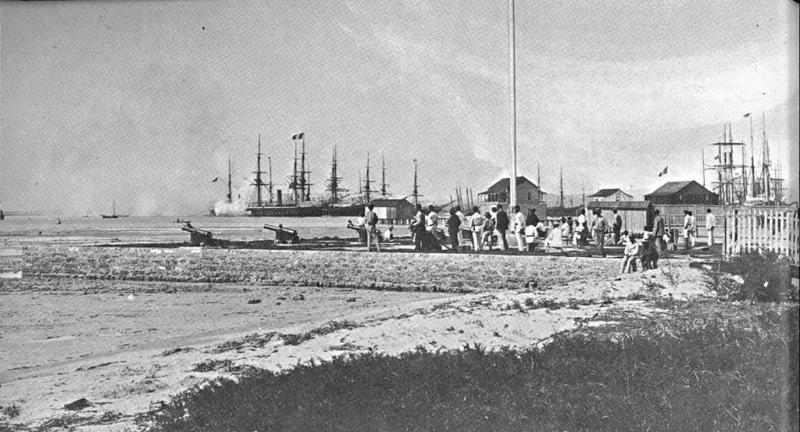 The image shows the Kaka‘ako Saluting Battery and flagstaff (Hammatt) 1887. In addition, I have added other related images in a folder of like name in the Photos section on my Facebook and Google+ pages.